The first day of third-quarter bank earnings kicked off Tuesday with a triple whammy. 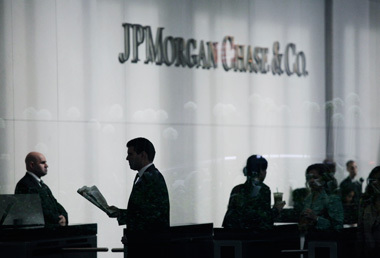 The first day of third-quarter bank earnings kicked off Tuesday with a triple whammy — with JPMorgan Chase (JPM), Wells Fargo (WFC) and Citigroup (C) all reporting Tuesday morning. After a significant loss the year before thanks to some weighty legal bills, JPMorgan returned to profitability in third quarter 2014. Meanwhile, Wells Fargo hit analysts’ expecations on the nose with earnings up 3% from third quarter last year. Citigroup, which exceeded analysts’ earnings expectations for the third quarter, announced in their earnings report that they would reduce their footprint from 35 markets to 24. JPMorgan Chase & Co., the U.S.’s biggest bank, today reported a third-quarter profit of $5.6 billion up from a loss of $0.4 billion the year before. Earnings per share were $1.36, missing analysts’ expectations of $1.38 per share but showing a considerable improvement from a loss of $0.17 a share a year earlier. Revenue was up 5% year over year, reporting $25.2 billion for third quarter 2014 — boosted in part by revenues from JPMorgan’s Markets & Investor Services and fixed income trading operations. Markets & Investor Services revenue was $6.1 billion, up 15% from the year before. The bank reported fixed income markets revenue of $3.5 billion, up 2% from the prior year, with “particularly strong performance in currencies and emerging markets,” the New York-based firm said today in a statement. JPMorgan’s asset management division saw long-term inflows for the 22nd consecutive quarter, reporting third-quarter profits of $572 million, up 20% from a year ago. Jamie Dimon, chairman and CEO of JPMorgan, commented on the financial results in a statement released by the bank. Wells Fargo, one of the largest mortgage lenders, reported third quarter earnings and revenue in line with analysts’ expectations. The bank reported a net income of $5.7 billion, up 3% year over year, and earnings per share of $1.02 that were also up 3% from last year. Analysts polled by Thomson Reuters expected earnings to hit $1.02 a share on $21.1 billion in revenue. Revenue hit those expectations, with Wells Fargo reporting revenue of $21.2 billion for third quarter 2014, up 4% from last year. John Stumpf, Wells Fargo’s CEO, discussed the bank’s third quarter and the overall U.S. economy in a statement. Wells Fargo’s Wealth, Brokerage and Retirement unit reported net income of $550 million, up $6 million, or 1%, from second quarter 2014. WBR revenue increase $3 million from the second quarter to $3.6 billion in the third, which the bank said was a result of “increased asset-based fees and net interest income [being] partially offset by lower gains on deferred compensation plan investments (offset in compensation expense) and decreased brokerage transaction revenue.” The retail brokerage group’s client assets were up 8% from the prior year, reaching $1.4 trillion in the third quarter, and their managed account assets increased 17% year over year, or $59 billion, to reach $409 billion in the quarter. The bank also reported strong loan growth with average balances up 19% year over year on growth in first mortgage and security-based lending. Wealth management assets were $219 billion in the third quarter, up 7% year over year. The unit’s retirement group reported IRA assets were $354 billion, up 8% from last year, and institutional retirement plan assets were up 6% year over year with $314 billion in the third quarter. Citigroup Inc., the third-biggest U.S. bank, reported its net income rose 7% year over year to $3.4 billion in the third quarter 2014, or $1.07 per diluted share, on revenues of $19.6 billion. Earnings per share beat analysts’ expectations of $1.12, reporting $1.15 a share excluding accounting adjustments. Citigroup’s Tuesday earnings announcement brought additional news that the bank would exit consumer operations in 11 more countries – affecting consumer franchises in Costa Rica, the Czech Republic, Egypt, El Salvador, Guam, Guatemala, Hungary, Japan, Nicaragua, Panama and Peru, as well as the consumer finance business in Korea, the New York-based company said in a statement. Check out ThinkAdvisor’s 2014 Q3 Earnings Calendar for the Finance Sector.